Here is the basic geometric shape used for the Cobb-Hepburn House. When the house was built in 1780, the town of Tinmouth was less than 10 years old. It was the frontier. Paper would have been precious, not generally available for drawing house plans. 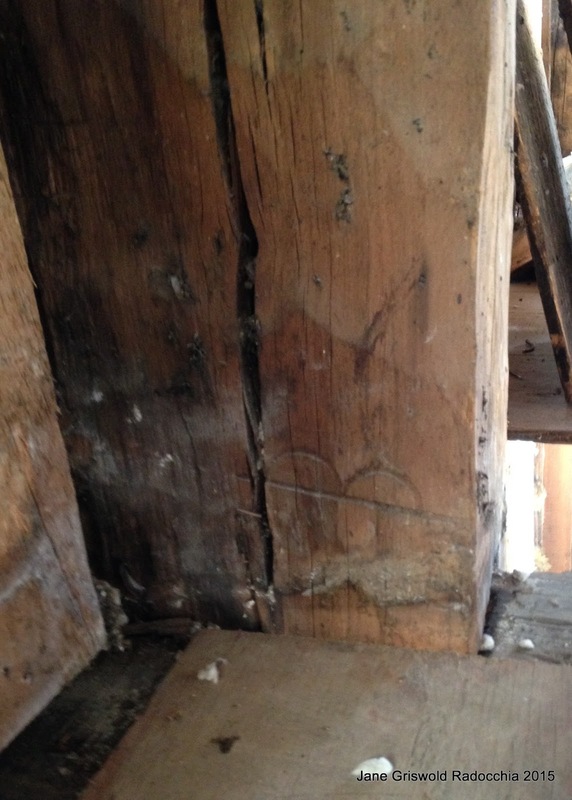 The master framer probably used dividers to layout the frame. We can see that he used them to draw the 2' off set marks on the posts. Look to the bottom right of the post - 2 half circles above a line. 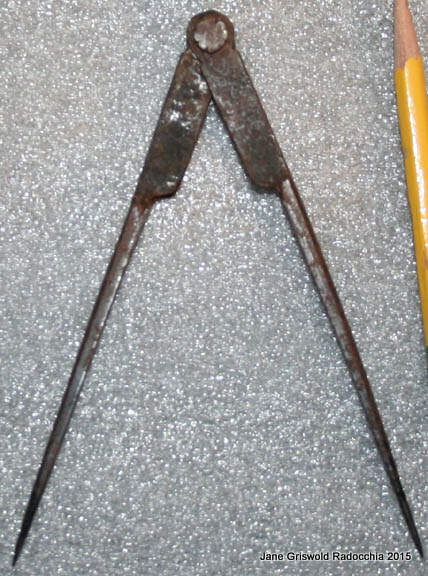 Sheathing was commonly used for diagrams. 25 years later when paper mills had become common, pattern books were popular teaching tools - beginning with basic geometry. A and B are illustrations of how to attach paper to a board. C is the T Square. H - the layout of a square using the length of one side. 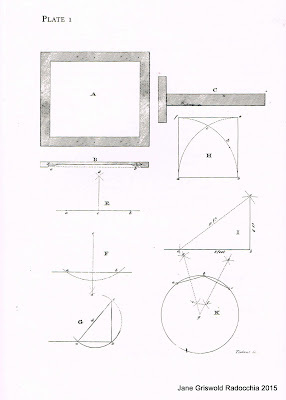 Biddle describes these engravings as " some of the most useful geometric problems which every carpenter ought to be acquainted with." He explains that a student should have "a bow-pen or compass". 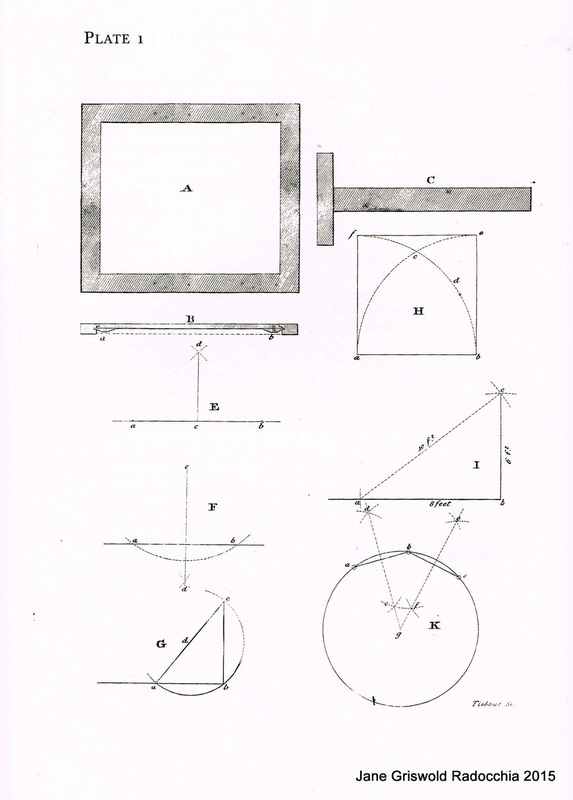 has similar diagrams on basic geometry for carpenters. All figures are explained on the accompanying page. Fig. 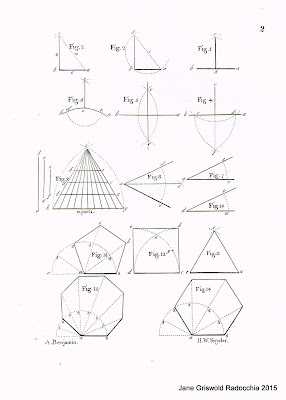 12 is the same diagram as Owen Biddle's H.
"I have first laid down and explained such problems in Geometry, as are absolutely necessary to the well understanding of the subject." 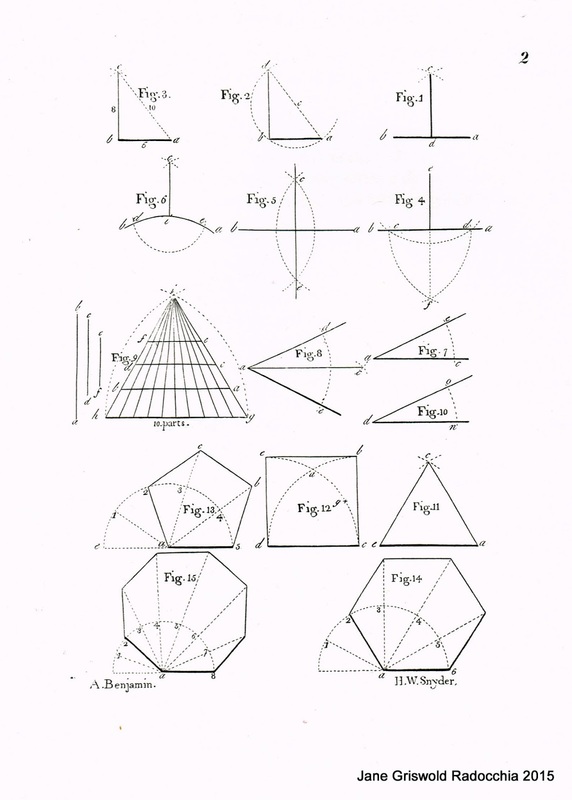 GEOMETRY, is that Science which treats the descriptions and proportions of magnitudes in general. 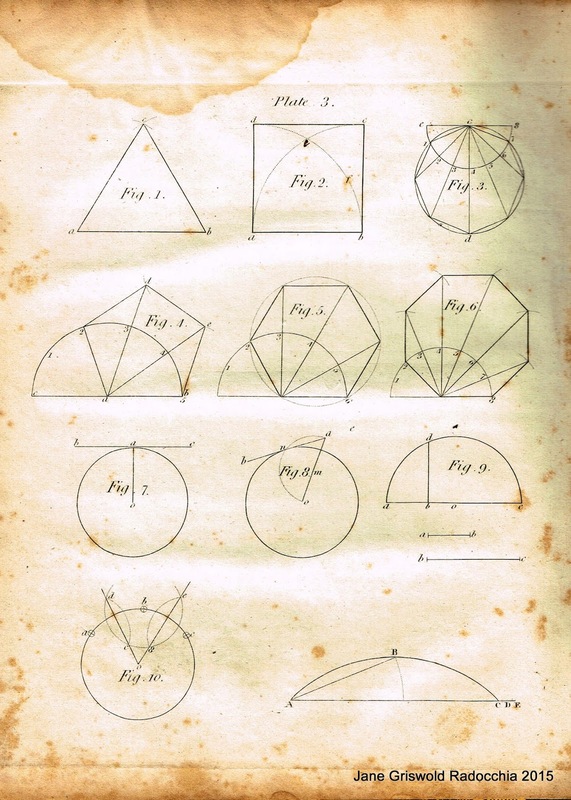 Peter Nicholson's Guide, first published in 1792, in England, begins with geometry. It was updated and reprinted many times in London, New York and Philadelphia. In his Preface Asher Benjamin writes that he is "indebted to P. Nicholson's excellent books". Figure 2 matches Benjamin's Fig.12 and Biddle's H.
This a a print of the actual page, Plate 3 - wear, age spots, and water stains included - in the 10th Edition, 1830. I have the book in my library - on a long term loan. I have written this post because of the skepticism I encounter from academics as well as craftsmen. 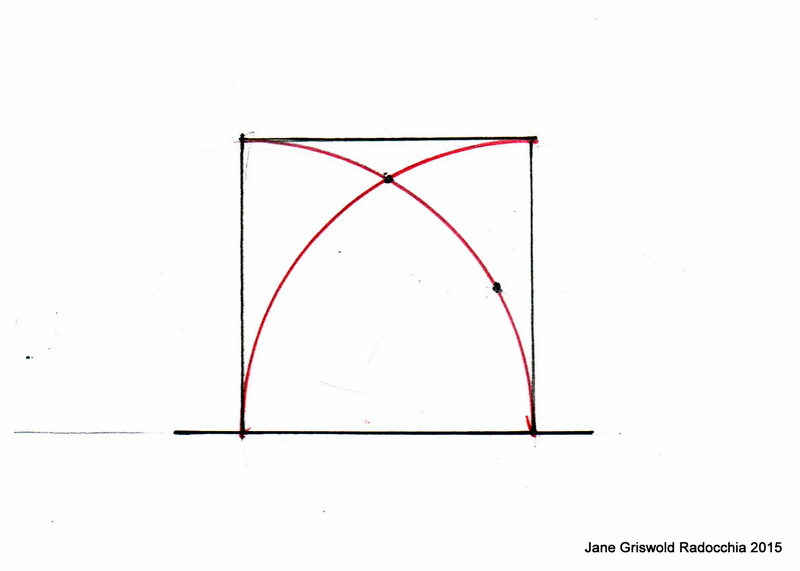 The use of geometry in construction is often viewed as somehow made up. I suggest doubters read what the master carpenters themselves wrote. Asher Benjamin, The American Builder's Companion, first edition published 1806, This print taken from the 6th Edition, 1827; unabridged republication by Dover Publications, Inc., 1969. Peter Nicholson, The Carpenter's New Guide: Being a Complete Book of Lines for Carpentry and Joinery, Treating Fully on Practical Geometry... 10th edition, John Griggs, Philadelphia, 1830. ME: giving a IPTN Workshop, July 22 - 24!